Disneyland visitors will be able to sit on an outdoor deck in Adventureland, watch boats from the Jungle Cruise ride by and eat exotic grab-and-go food when the park's newest eatery opens later this year, according to the Disney Parks blog. 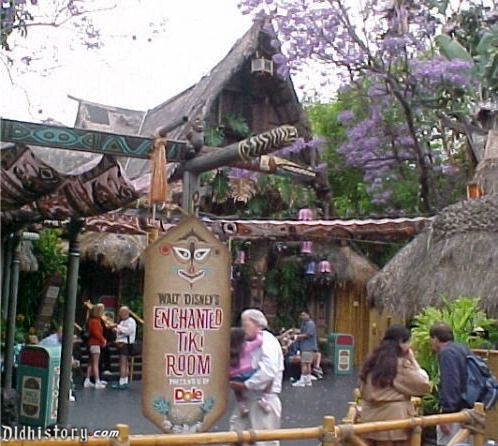 The blog provided a few more tantalizing details about the new Tropical Hideway eatery under construction next to the Enchanted Tiki Room. This spot is being carved out of the former Aladdin's Oasis, which was itself originally a Polynesian-themed restaurant that opened in June 1962 as the Tahitian Terrace. Disney officials are saying they plan to add exotic foods such as warm bao buns with spiced vegetable, kaffir lime chicken and bulgogi beef fillings. They're also planning to offer ramen salad, sweet pineapple lumpia spring rolls with cream cheese, along with other international foods as well. "After picking up a snack or two, choose a spot on the open-air dock, soak in the sights of the Jungle River waterfront, sit back, and listen to the musical sounds of the tropics - all while experiencing delicious new tastes! After the sun goes down, flickering torch lights will illuminate the area, transforming The Tropical Hideaway into an enchanting nighttime venue," according to the item posted Aug. 28 to the Disney Parks blog. Although Asian foods are offered at Disney California Adventure at the Lucky Fortune Cookery and also annually during the Lunar New Year festival, currently the primary Asian-inspired foods in Disneyland are sold at the nearby Bengal Barbecue, also in Adventureland. Bao buns are tasty little pockets of steamed dough that have various sweet or savory fillings, found particularly in China and Indonesia. AJ Wolfe, who runs the independent Disney Food Blog, was sampling food at Walt Disney World on Tuesday morning. She said the foods announced so far have been a hit in Florida. "Bao buns have been super popular at Disney World, so I don't see any reason who they wouldn't be popular at Disneyland, especially with the large local Asian population," Wolfe said. She said the pineapple lumpia sounded exactly like one that she had tasted that very day at Animal Kingdom. "I love it, but it's a love-hate thing with those. Some people love them, some don't," Wolfe said. A Pongu Lumpia with pineapple and cream cheese was being sold Tuesday at Walt Disney World for $2.99. Disney typically doesn't say how much its renovations cost, but a $1.7 million building permit was issued by the city of Anaheim Dec. 27 to convert the existing space and remodel the restroom. Projects often require more than one permit before completion. Disney expert Todd Regan said the new dining deck will be a crucial rest area because Disneyland is removing seating around the park in order to widen walkways for the expected Star Wars: Galaxy's Edge opening crowds. "I think it's going to be one of the essential spots for tired families to sit and rest before they go on more rides," Regan said. "This is a much-needed new out-of-the-way spot."